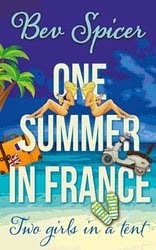 One summer in France is a light-hearted, breezy memoir, which will resonate with anyone who survived the 80s. Bev Spicer’s account of a 1979 summer spent with her friend Carol in France is littered with cultural references such as pop music and the notoriously popular ‘Charlie’ perfume. Spicer’s description of her university life in Keele will strike a chord with those of us who have endured communal living. She humorously depicts the mix of people you are likely to find yourself living amongst, including the universally loathed obsessive food labeller. The memoir is set at a time when the world was a more innocent, less security conscious place and life moved at a slower pace. Education was not only free but bursaries were being handed out like biscuits, hence the £350 that Bev is awarded for a so-called cultural experience in France. Spicer captures the sheer joy, naiveté and arrogance that goes along with being twenty but tempers it with the wry nod of her older self. It’s her a 80s adult voice that acknowledges how lucky students of the 70s and 80s were in comparison to now and we sense her adult dismay at the wild abandon with which the girls travel helmetless and fearlessly on their hired mopeds. Interrailing, for lots of us in the 80s, was a rite of passage and Spicer perfectly evokes the mood of that time when every European kid under the age of twenty five seemed to be on the move. Her memoir is, for the most part, a series of encounters that Bev and Carol have with different people such as the locals whose only livelihood comes from tourism, parents who are desperate to offload their kids onto the girls and the spectacular fifteen year old Swedish girl happily travelling around Europe by herself. We see the cultural differences filtered through the eyes of two middle-class students whose only agenda is to have a good time. What comes across loud and clear is something that we probably already know but is always pleasing to revisit and that’s the fact that people are generally good and decent wherever in the world you happen to go. What I particularly enjoyed about the memoir is the relationship between Carol and Bev. The girls are very different; Carol is loud and confident whereas Bev fancies herself as a bit of an intellectual, taking great pains to let the people around her know she is reading the likes of Moliere or Baudelaire. The story though, at its heart, is a celebration of friendship and the kind of intense friendship that is unique to young women. If you are looking for a light read that will take you down memory lane and have you chuckling at Bev and Carol’s adventures then this is the book for you.